1. Place the lamb into a large bowl and mix in the anchovy paste or gentleman’s relish. Season with lots of black pepper. Form into 4 rough patties, about 1.5cm thick. Cover and chill for 20 minutes, or for up to 2 days. 2. Beat the butter until smooth, before mixing with the crumbled Stilton. Wrap the butter in clingfilm to make a cylinder. Chill until solid, then cut into 4 rounds. Keep cold until needed. 3. Remove the burgers from the fridge 10 minutes before cooking. Meanwhile, cover the shallots with just-boiled water and leave to sit for 5 minutes. Drain well, then mix with the red wine vinegar, honey and a pinch of salt. Set aside. 4. Warm a griddle or large frying pan over a medium heat. Rub the burgers with the oil, then fry, turning often, for 15-18 minutes, or until cooked through and piping hot in the centre. Set aside to rest under foil. Increase the heat and toast the cut side of the buns for 1-2 minutes, in batches, until browned (they should absorb some of the lamb fat as well). 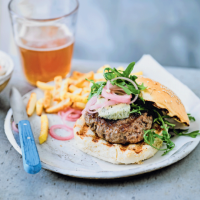 Fill the buns with the pickled shallots, followed by the burgers, rounds of Stilton butter and some rocket leaves. Serve with fries and coleslaw, if liked.